A fresh vision of a different Spider-Man universe, with a ground-breaking visual style that's the first of its kind. 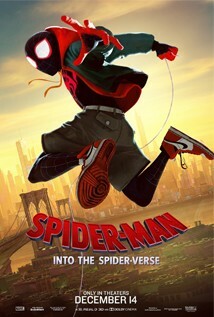 Teen Miles Morales (Shameik Moore) becomes the Spider-Man of his reality, crossing his path with five counterparts from other dimensions to stop a threat for all realities. The confusion that comes from keeping track of Peter Parker’s adventures in so many other versions of this tale, is all part of the charm in a wildly imaginative adventure that uses dimensional physics to lighten the baggage currently weighing down the rest of the superhero genre.